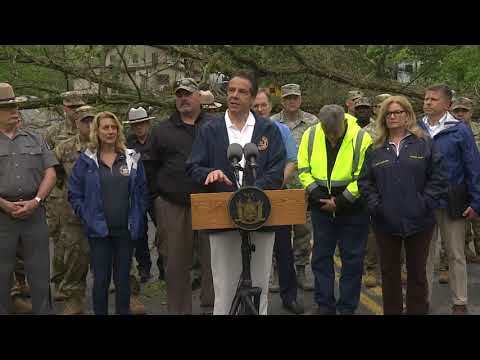 Thousands of Westchester and Putnam residents remain without power as of 3:30 p.m. following Tuesday’s storm that struck the area, taking down trees and sending utility lines flying throughout the region and prompting an extensive recovery effort. Putnam, where a state of emergency was declared by Gov. Andrew Cuomo, was hit hardest , followed by Northern Westchester. In Putnam, as of just before 4 p.m., 25,549 of NYSEG's 38,310 customers in the county were still in the dark. In Northern Westchester, 12,893 of NYSEG's 32,806 Westchester customers reporting outages are still in the dark. Among the hardest hit municipalities were Somers (6,387 outages reported as of Wednesday afternoon), Carmel (5,858), Kent (5,704), Southeast (4,601) Putnam Valley (4,103), Patterson (4,008), Lewisboro (2,757), Bedford (1,260), Brewster (1,221) and North Salem (1,055). Just 271 outages were reported to Con Edison as of Wednesday afternoon, impacting 1,879 customers.